! This is NOT a method of direct communication with AUBURN FLOWERS & GIFTS for purposes of ordering or rectifying problems. I want to thank your team of design florist. You really knocked it out of the ballpark. I’m very impressed with how you worked with me. The delivery and arrange we’re right on target. It was exactly what I wantEd. My daughter and the style is she works with at parlor 113 really have enjoyed the arrangement. I feel so lucky to have found you online! Thank you so much for your help in selecting a gift and the awesome same day service. Recipient contacted me a day after receipt of flowers to tell me they were among the prettiest arrangements she'd ever seen! Thank you!! So glad she enjoyed them! Thank you so much. Everything was a perfect surprise and just as I had hoped! loved being able to order online. My friend loved her flowers. The young lady called me all the way in Florida to clarify my order, make a suggestion - which she was absolutely right - and my daughter just loved the flowers, balloons, and teddy bears! A-plus in my book!!! Thank you so much taking the time to review our work. We love what we do. Happy to help anytime! the flowers were very wel received. Everyone at the recipient's family reunion thought they were gorgeous. Thank you. I am very happy with the order and service. I ordered online and received a phone call confirming my order, and describing some options I had to make my gift more personal. Very professional and friendly service. Prompt service and very cute packaging! The plant was lovely and arrived to me in good condition. Thank you! Ordering online was very easy and delivery was made within a few hours if order. My mom loved the cookie dish! I would definitely order from this company again! Interesting experience. The original delivery was made to the incorrect address and the deliverer tried to get me to go knock on a total stranger's door to get my own flowers when it was not my mistake. However, after calling the shop again and explaining the situation, an incredibly nice woman made me a new bouquet and delivered it an hour later!! AMAZING service based off of the second lady!! The first delivery person wasn't the best. Hi! Thank you so much for your review and feedback. Yes, you should have never been asked to go and get your own flowers from another house!! If we don't know where problem areas are it's impossible to fix them. Thank you for letting us know about the delivery snafu. We talked thru the process with all the drivers about how to correct mess-ups. So glad we could make it right in the long run and thank you for the kind review! Wonderful service and beautiful flowers! Will most definitely use again!!! We were very happy with every aspect of your service! The flower arrangement was fresh and beautiful. The family was impressed with the arrangement and most appreciative of its appropriateness for their loved one. Thank you for making this goodbye a little easier. Thank you for delivering the flowers promptly. Incredibly kind service, quick delivery, and beautiful flowers. I would highly recommend Auburn Flowers & Gifts. Super fast delivery and recipient loved her junk food basket and balloon! Will use Auburn Florist and Gifts again when I need to send something in the AU area! Delivered when expected. I never saw the flowers, but the co-worker for whom they were intended raved at how pretty they looked. Will use this company again. Thanks for the help in making may lady's day! Everything was perfect. I will certainly be seeking out you guys for any future arrangements. I ordered flowers for my daughter's birthday, she lives in Auburn, I live in Michigan - go State. I was greeted soo warmly on the phone and the flowers that were delivered were just fabulous. The delivery person was extremely polite and friendly too. What a wonderful experience. I would certainly order again from your establishment. Thank you for the very pleasant experience!!!!! Perfect! I was worried about delivery being timely on Valentines Day, but everything went perfect through you guys. I'm sure i'll use you again next year! Online ordering was very easy. Flowers arrived as promised and were very beautiful. Did not want typical arrangement and recipient loved the arrangement and enjoyed the fresh style! Great service! Will order again when sending flowers in the area. Very eastpy to order. They called to confirm details. Flowers were promptly delivered and we're beautiful. The flowers delivered were beautiful. The only thing was, that my boyfriend said he chose the balloon option but wasn't able to choose what kind of balloons he wanted so I ended up with birthday balloons instead of romantic type balloons when my birthday isn't until May. But other than the balloons everything else was perfect! Thank you so much for that feedback Nichole! We do need to add a notes field on the balloon option so that the occasion is very clear. Will get to work on that! We're so glad you enjoyed the flowers and we'll be sure to get the balloons right next time around. Thanks again! I was charged 3 times for delivery for the same order that occurred at some time. Hi! Yes, delivery is charged individually for each arrangement purchased. When multiple arrangements are purchased for delivery to the same location we always refund the duplicate delivery charges. Your delivery refund for the two duplicate addresses was processed quickly. Please let us know if there is anything else we can do to help! Attractive website. Easy ordering. Great that there was an alternative to flowers. Loved Loved Loved my flowers!! I was very pleased with the presentation and delivery of the flower arrangement!! We're so happy you were pleased. Thank you for your business and call us anytime! Delivered on time to my wife on campus, even after I messed the order up online and called them to correct it. Excellent customer service. Will buy from them again. The flowers sent to me by one of my children on my birthday are beautiful and expertly arranged. I really appreciated the message alerting me to the presence of the thowers on the porch. The flowers were beautiful and delivery was great. Beautiful arrangement. Exquisite flower choices and in grat shape. Great experience ordering online. Flowers got there on time and the balloons were great. I will definitely order form Auburn Flowers and Gifts again. the flowers arrived on time and were gorgeous! 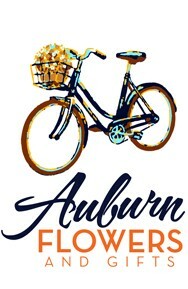 I will definitely use Auburn Flowers and Gifts for future flower arrangements to our college student! Beautiful arrangement - it made my daughter's 24th birthay! The flowers are very beautiful! The best part is they were delivered with a smile. Thank you!!! Beautiful arrangement that lasted longer than I expected.